December CHESS has just been delivered. 'Wot no Christmas Quiz' - yes it comes in January. ...count them. 9 Black pawns. Must be a version of Fischer Chess. What a breath of fresh air the November issue was. 11 pages devoted to the kids tournament THE TERAFINAL. blunders behind every corner. We should get more of these games. happen until move 40 when somebody misses a shot in time trouble. one game that caught my eye in the November issue was Mirzoeva-Gore. (page 57). The opening note stated; Alan (Gore) was planning to play "Reprintev's Surprise"
as advocated by Andrew Martin in the April Chess. I've seen this. It's Naff. 1.e4 d5 2.exd5 Qxd5 3.Nc3 Qa5 4.d4 Nf6 5.Nf3 Ne4?! Andrew looks at 6 Bd3. 6 Qd3 and 6 Bd2. Morphy must be sloshing about in his watery grave. in the opening. The remedy is always the same. Whack f7. So the move must be 6 Bc4. This one has a nice Knight sac Queen sac. The only surprising thing is how come Andrew Martin missed this? See when these guys get good, they forget how to play Chess. I was messing about with the chess playing program Gromit. randomly on the back ranks for you. One set up was this. There is a Fool's Mate here. 1.b3 e6 2.a4 Qa3 mate. with openings dedicated to Fischer Chess? and a few days ago I played over the game on page 90. Taimanov misses a mate in 3 and losses. (mate in 4 if Black gives up his Queen). seen this fact mentioned anywhere. unforgettable encounters. It should have been. and found the score of the game. No. It's there too. Exactly as Gufeld gives it. I'm not joking - here is the game. Play it over and see if you can spot the mating moves. no forced win for White in the following game. (I would never stoop so low as to carve up a masterpiece). so you should have it even on the smallest DB. And don't simply paste the game into Fritz. give you a tweak. I got tweaked. I never ignore a 'tweak' when I get one. Never. the key move at the bottom of this piece. Which brings me on nicely to Helpmates. Black to play and black helps white to mate him in two moves. So black moves, white moves, black moves, white mates. Recognise the position? (two solutions). 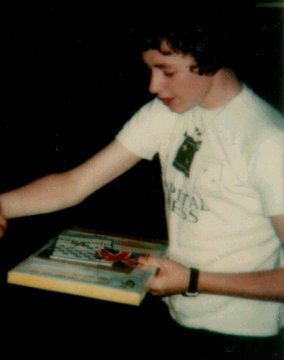 he was 11 or 12 wearing a CAPITAL CHESS T-SHIRT. A Capital Chess T-Shirt. A collectors item. You know what people are like. If they don't know the facts - so they make them up. against Wilson's Disease since 1997.
and these have had various side affects. helped us win the First Division. Helped is the wrong choice of words. He won us the 1st Division title. R. France, M. Condie, T. Dimitrov. 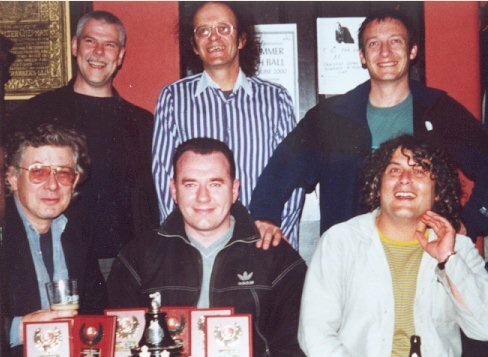 Division 1 with Keith Ruxton on board 1.
in the same team. Then we could take on the World. a victim or sunk into a state of deep depression. He has fought the thing every step of the way. hopeful and upbeat about a new form of medication from America. He asked me how my chess was going. against Alan Andrews of Wandering Dragons. 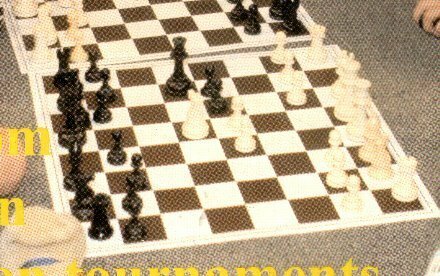 a Spassky game and a missed win v Short. These guys are just names in print to me. Mark has locked horns with them. he missed a Bishop sac and the game ended in a draw. This was the critical position. 22...Bxc3 gives black a winning position. has the 'Bonus' of having an easy to see perpetual. A hard move to resist, one can sac with impunity. I'm not alone in hoping that his recovery is very soon. 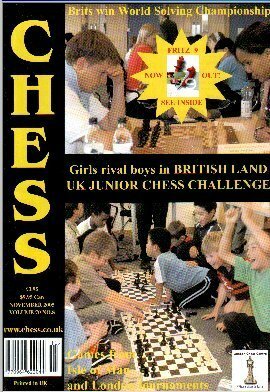 Right I'm off to read the latest CHESS. Helpmate 1...Kh8 2 Ne5/g5 Rg8 3 Nxf7 mate.